Prime Minister Benjamin Netanyahu threatened to annex areas of the occupied West Bank ahead of the coming week's Israeli Knesset elections. In an interview on Israeli TV, he was asked about plans to annex settlement blocs in the occupied territory, and responded: "Will we go to the next phase? The answer is yes. We will go to the next phase to extend Israeli sovereignty..." In a part of the interview seemingly reported in English only by the independent Palestinian Ma'an News Agency, Netanyahu also appeared to broach annexation of all Area C, the zone of mixed Israeli and Palestinian control, which covers 62% of the West Bank's territory. Asked about the future status of Area C, he reportedly replied: "I promise that you will be surprised. I cannot talk about the plan, but Trump is a big friend and I doubt there will ever be any bigger friend than him." 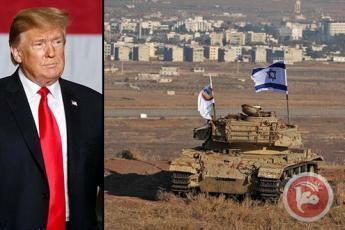 Amid a new round of Israeli air-strikes on Gaza, Prime Minister Benjamin Netanyahu met with Donald Trump in Washington for the signing of a presidential proclamation officially recognizing the occupied Golan Heights as Israeli territory. At the joint press conference, Trump said, "We will confront the poison of anti-Semitism." We hope it is unnecessary to point out the perversity of Trump exploiting the threat of anti-Semitism to justify US recognition of an illegal Israeli annexation of Syrian territory. In Episode 29 of the CounterVortex podcast, Bill Weinberg advances a progressive, anti-Zionist critique of Rep Ilhan Omar's controvesial comments, which have posed the problem of US support for Israel in terms of "allegiance to a foreign country"—the nationalist and xenophobic language of our enemies. 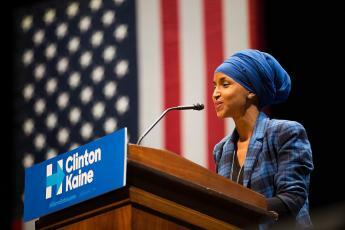 As a Somali-American woman in a hijab, Omar is ultimately legitimizing reactionary forces that threaten her with the use of such rhetoric. As the massacres of Christchurch and Pittsburgh too clearly demonstrate, Islamophobia and anti-Semitism are fundamentally unified concers—and the way Jews and Muslims have been pitted against each other by the propaganda system is part of the pathology. Contrary to the canard of "dual loyalty," Weinberg decalres himself a "zero-loyalist," repudiating both Zionism and America-first nationalism, calling for an anti-Zionism based on solidarity with the Palestinians, not "allegiance" to the imperial state. The UN Human Rights Council released the Report of the Independent International Commission of Inquiry on the Protests in the Occupied Palestinian Territory, finding potential crimes against humanity committed by Israel. The report focuses on the seven-month period last year when the Gaza protest campaign known as the "Great March of Return and the Breaking of the Siege" was taking place. During this period, 6,106 unarmed protesters were shot by military snipers, resulting in 189 Palestinian deaths. The secretary general of the Palestinian Liberation Organization executive committee, Saeb Erekat, issued a statement rejecting the US-led conference in Warsaw, ostensibly aimed at brokering Middle East peace. Said Erekat: "Today we face a reality whereby the US Trump administration, in cooperation with the Polish government, is pushing yet a new initiative to annihilate the Palestinian national project." Poland has been making some efforts to resist turning the conference into a propagandistic anti-Iran meeting dominated by the US, Israel and Saudi Arabia. The notable absentees from the summit are meanwhile convening their own meeting in the Russian resort of Sochi. The rival summit is bringing together Vladimir Putin, Turkey's Recep Tayyip Erdogan and Iran's Hassan Rouhani. 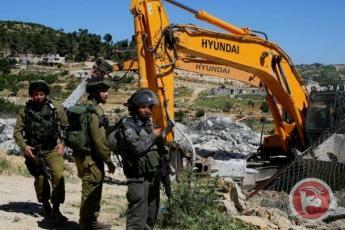 Israel demolished 538 Palestinian homes and facilities across the occupied West Bank and Jerusalem in 2018, leaving 1,300 Palestinians, including 225 children, homeless, according to a year-end report by the Abdullah Al-Hurani Centre, an affiliate of the Palestine Liberation Organization. The report stressed that these demolitions were carried out in violation of the Fourth Geneva Convention and other international norms. It charged that Israel "continues its policy of ethnic cleansing against the Palestinians in the occupied West Bank and Jerusalem," pointing out that, in addition to the demolitions, Israel issued 460 "stop-building orders" during the same period. The State of Palestine filed a complaint with the International Court of Justice (ICJ) challenging the relocation of the US embassy from Tel Aviv to Jerusalem as a breach of international diplomatic law. In support of its claim, Palestine directed the ICJ to multiple UN General Assembly and Security Council resolutions affirming the special international regime that applies to Jerusalem and calling on member states to refrain from recognizing Jerusalem as Israeli territory. Palestine argued that establishment of an embassy to Israel in Jerusalem violates provisions of the Vienna Convention on Diplomatic Relations governing activities in the "receiving state." The lines are starkly drawn in Pittsburgh—and, hopefully, across the country—in the wake of the synagogue massacre that left 11 dead. President Trump visited the synagogue, and was joined by the Israeli ambassador. More than 35,000 people signed an open letter to Trump from the local chapter of the progressive Jewish group Bend the Arc, stating: "You are not welcome in Pittsburgh until you fully denounce white nationalism." Hundreds demonstrated against Trump's visit under the standard of another Jewish progressive formation, If Not Now, with banners reading "ANTI-SEMITISM = WHITE NATIONALISM" and "ANTI-SEMITISM UPHOLDS WHITE SUPREMACY." Protesters for both the besieged Gaza Strip and the besieged Syrian enclave of Ghouta gathered in New York's Union Square on Friday night, April 6. Those standing for Gaza and Ghouta should be natural allies, but there was little interaction between the two protests. And some (by no means all) among the Gaza protesters were followers of Stalinist factions that support the dictatorship of Bashar Assad—who is raining death down on Ghouta just as Israel has serially rained death down on Gaza. What will it take to provoke the conversation that needs to be had on the American left, and build the unified but multi-issue movement so desperately needed at this dangerous moment, with fascist forces on the advance worldwide? From anonymous radical-right xenophobes in Britain came the call to make April 3 "Punish a Muslim Day." Letters were sent to addresses across England, calling for violent attacks on Muslims. Police were on alert, and women who wear the hijab were advised to stay home. There were also reports that some of the letters had arrived at New York addresses, causing the city's Muslim community to mobilize and the NYPD to beef up security. Brooklyn Borough President Eric Adams joined multi-faith leaders to condemn the threats. His comments were laudable in intent, but revealing in their wording: "Our message must be just as loud. Not punish a Muslim, let’s embrace a Muslim, let’s embrace a Christian, let’s embrace a person of Jewish faith..." Why has the word "Jew" become taboo, and especially in progressive circles? The Southern Poverty Law Center (SPLC) issued a pressingly important report, "The multipolar spin: how fascists operationalize left-wing resentment." It refreshingly called out "red-brown populist collaboration"—documenting the growing convergence between figures on the supposed "left" and the radical, even fascist right, both in the US and in Europe. But, depressingly, at the first howls of protest from this very Red-Brown alliance, SPLC folded like punks, removing the report from their website and issuing a weak apology. Nazis scapegoat Jews for legal pot —what a surprise! Even back in the bad old days of Reefer Madness in the 1930s, when marijuana's association with Mexican immigrants and African American musicians was used as propaganda for the first federal laws banning the weed, it never came to this. But the canard that cannabis is a tool in a sinister Jewish conspiracy to subvert wholesome white American youth has now entered (almost) mainstream discourse. American Conservative finally gave far-right ex-spook Philip Giraldi the sack over rank anti-Semitism after one of his evil screeds was tweeted by Valerie Plame. Would that some of our supposed allies in the Palestine struggle were as principled as our conservative enemies. Counterpunch, ANSWER, Al-Awda and MondoWeiss continue to promote Giraldi and/or his equally vile sidekick Alison Weir. Are the "false flag" theories about the anti-Semitic threats vindicated by the bust of a confused Israeli youth? Or is a Jew exploiting anti-Semitism still anti-Semitic? Omar Barghouti, independent Palestinian political analyst, makes the case for boycott, divestment and sanctions against Israel.